This time tomorrow I will be reunited with my Morticia. For the last 2 weeks I've been a single father whilst my good lady has been on holiday in the United States of America, to be more exact Memphis on a pilgrimage with her mother to the land of Elvis. I've never seen what the big deal with Elvis or the industry that has grown up following his demise. As a Star Trek fan I'm the last one to cast aspersions on any one's obsessions and I'm not about to start. She flew out a week last Monday, we've been separated before but never in our lives (and I'm talking about the time before we were even together) have this many miles been between us. Her plane landed on Tuesday morning but has been staying with her mother mainly because of the difficulty picking her up midweek, and to give her a chance to get over the jetlag. I've missed her terribly and I've realised that she is the one that keeps me in line. You hear all the time about people's other halves, it's no exaggeration. She's my everything and it shouldn't take being apart for me to realise and appreciate her. I can't wait until tomorrow. 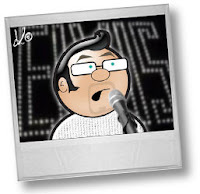 My Mum loves Elvis too - I remember on the morning that he had died - getting up and finding my Mum in the lounge crying!